BOGA - Articles, World Record set by BOGA Members! 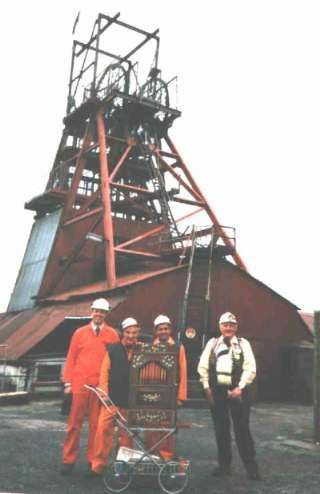 On the 15th of October 2000 Tom Paddon and Bob Roberts visited the Big Pit at Blaenavon, South Wales and established a record for the 'lowest’ note ever played on a street organ. Accompanied by an experienced miner they descended the pit shaft in the lift cage taking with them a Trueman 21 note organ. The organ was then trundled down narrow, damp tunnels to a point 370 feet below ground level. Here Tom played ‘Cwm Rhondda’ which was followed by a rendition of 'Congratulations’ by Bob. Back at the surface visitors and mine staff were treated to a full grinding session and a collection was made for the charity, Deafblind U.K. Thanks are due to the Manager and Staff at Big Pit for their cooperation which enabled the intrepid BOGA members to achieve this World Record.